Η ανοσοθεραπεία για διάφορα είδη καρκίνων ή και αυτοάνοσων νοσημάτων έχει θεαματικά αποτελέσματα σε εξατομικευμένες περιπτώσεις με πλήρη ίαση του καρκίνου όπως το μελάνωμα. Βέβαια η επιτυχία της ανοσοθεραπείας εξαρτάται από το είδος των μεταλλάξεων και την ακριβή μοριακή διάγνωση που κατευθύνει και την στοχευμένη ανοσοθεραπεία. Επειδή η ανοσοθεραπεία επεμβαίνει στους ανοσολογικούς μηχανισμούς της νόσου, οι μακροχρόνιες επιπλοκές της στην λειτουργεία του ανοσοποιητικού είναι μέχρι στιγμής άγνωστες. Χρειάζεται συνεχής επιστημονική έρευνα για την διευρεύνηση της καλύτερης εφαρμογής της ανοσοθεραπείας στην αντιμετώπιση του καρκίνου και των ανοσολογικών νοσημάτων. The origins of cancer immunotherapy date back more than 2 decades to when researchers explored ways to amplify the immune system to attack tumor cells. At the time, scientists hypothesized that tumors were able to evade immune surveillance because tumor cells lacked costimulatory molecules required to signal T cells to the presence of the tumor. PD-1 and CTLA-4 checkpoint inhibitors prevent tumor cells and antigen presenting cells, respectively, from suppressing tumor-reactive T-cell function. However, in the mid-1990s, James P. Allison, PhD, and his colleagues at the University of California, Berkeley, Cancer Research Laboratory discovered that rather than lack costimulatory molecules, tumor cells and other immune cells expressed inhibitory molecules that disabled T cells from recognizing and eliminating tumors. These early experiments compared tumor growth in mice that had received injections of cytotoxic T lymphocyte–associated molecule 4 (CTLA-4) antibodies with tumor growth in mice in a control group (Leach DR et al. Science. 1996;271:1734-1736). Allison and his colleagues hypothesized that the antibodies would turn off CTLA-4, a receptor that dampens T-cell activity, and thus unleash an attack on the tumors. The experiment results were striking. “The idea was that the brakes come on at a certain point. If we just disabled the brakes, [the immune system] can keep going until it has time to kill the tumor mass. In the first experiment, in the control group, all the mice had to be euthanized because they grew big tumors. In the [treated] mice, the tumors had gone away,” recalled Allison, who at the time was director of the Cancer Research Laboratory. But when the data were published in Science in 1996, the response from the research community was more like a collective shrug than a buzz of excitement, recalled Allison, now the executive director of the Immunology Platform and chair of the department of immunology at the MD Anderson Cancer Center in Houston. “Cancer immunotherapy had a checkered history,” he said, noting that disillusionment had set in among researchers after interleukin-2 and cancer vaccines failed to meet high expectations for their success. Despite the initial muted response to his work, and nearly 2 decades after the publication in Science, Allison received both the 2015 Lasker-DeBakey Clinical Medical Research Award and the 2015 American Society of Clinical Oncology’s Science of Oncology Award for his work that contributed to the development of cancer immunotherapy. Now, dozens of clinical trials are under way to study how these drugs work on several different types of cancers, and oncology researchers are trying to determine why these drugs are lifesavers for some patients but fail to help others. The discovery that suppressing inhibitory receptors on T cells with monoclonal antibodies could help destroy tumors was a “paradigm shift,” said Allison. Instead of a cancer therapy that attacked the tumor directly or stimulated the immune system to attack a tumor, CTLA-4 monoclonal antibodies simply allowed the immune system to do its job without being turned off prematurely, Allison explained. CTLA-4, programmed cell death protein 1 (PD-1), and other similar receptors expressed on T cells function as immune system checkpoints that negatively regulate T-cell activation. These inhibitory T-cell receptors bind to effector molecules on tumor cells or antigen-presenting cells, thereby suppressing tumor-reactive T-cell function. Monoclonal antibodies that block immune checkpoints by binding to and inhibiting these T-cell receptors provided the foundation of modern checkpoint inhibitor drugs. Before the first clinical trial was launched to test the efficacy of T-cell receptor monoclonal antibodies, Allison spent 2 years presenting the anti–CLTA-4 antibody to pharmaceutical and biotechnology companies. Eventually, a small company, Medarex (later purchased by Bristol-Myers Squibb), agreed to conduct clinical trials investigating the drug, called ipilimumab, as a treatment for metastatic melanoma. Results from a phase 3 study indicated that at 24 months, the overall survival rates for patients treated with ipilimumab plus a glycoprotein peptide vaccine, ipilimumab alone, and the vaccine alone were 21.6%, 23.5%, and 13.7%, respectively (Hodi FS et al. N Engl J Med. 2010;363:711-723). Continued follow-up of patients found that the approximately 20% of patients who responded to ipilimumab survived for several years, and an analysis published this year showed survival rates for some patients spooling out to 10 years (Schadendorf D et al. J Clin Oncol. 2015;33:1889-1894). 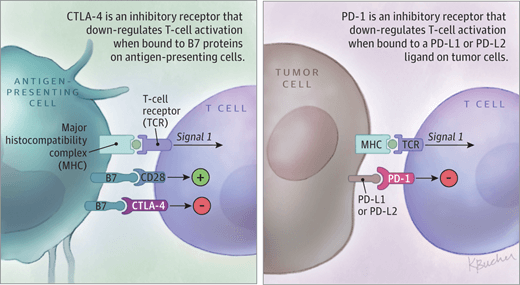 Years of preclinical and subsequent clinical research have led to the development of 3 checkpoint inhibitor immunotherapy drugs—ipilimumab and the anti PD-1 monoclonal antibodies pembrolizumab and nivolumab. Between 2011 and 2014, the Food and Drug Administration (FDA) approved all 3 drugs for the treatment of advanced melanoma. These and other checkpoint inhibitors under development are being tested for their efficacy in treating an array of cancers, including non–small cell lung, kidney, brain, lymphoma, and prostate cancer. For example, a recent study indicated that nivolumab is effective in treating advanced squamous-cell non–small cell lung cancer; the study showed that patients previously treated with chemotherapy who received nivolumab had a 1-year overall survival rate of 42%, compared with a 24% 1-year survival rate for patients treated with a standard chemotherapy drug, docetaxel (Brahmer J et al. N Engl J Med. 2015;373:123-135). The clinical efficacy of checkpoint inhibitors reveals a paradox. Unlike illnesses such as depression, in which the pathogenic influence of multiple genetic mutations can make it harder to develop effective treatments, the more mutations that a cancerous tumor has, the more likely it is that an immunotherapy drug will be effective. Research suggests that tumors with multiple genetic mutations create more antigens that attract T cells (Snyder A et al. N Engl J Med. 2014;371:2189-2199). That’s why melanoma tumors, which have a high mutational load, respond well to checkpoint inhibitors, said Steven O’Day, MD, director of immuno-oncology and clinical research at the John Wayne Cancer Institute in Santa Monica, California, who was involved in early melanoma trials for ipilimumab. Because such genetic variations in tumors can dramatically affect how well a patient responds to a checkpoint inhibitor, researchers need to delve into the genetic and molecular composition of tumors, Allison explained. One way to do that, he said, is to conduct clinical trials of small groups of patients, “and just look as deeply as you can,” he said. Two recent studies focusing on the mismatch repair gene and mutations in non–small lung cancer tumors were smaller-scale studies involving 41 and 64 patients, respectively. One study determined that 78% of patients with colorectal tumors with mutations of the mismatch repair gene—which repairs mistakes in DNA replication—had progression-free survival at 20 weeks after treatment with pembrolizumab, compared with only 11% of patients with colorectal tumors without the mutation (Le DT et al. N Engl J Med. 2015;372:2509-2520). Because a mutation in the mismatch repair gene can result in a greater number of mutations in a cell due to the faulty DNA repair process, patients with the mutated mismatch repair gene have more neoantigens on their tumor cells to attract T cells. Another study found that patients with non–small cell lung cancer with high levels of mutations in their tumors linked to smoking were more likely to have a durable clinical response to nivolumab than patients with a low level of mutations in their tumors—73% compared with 13% (Rizvi NA et al. Science. 2015;348:124-128). Researchers are also studying how checkpoint inhibitors can most effectively be used in combination with each other or other cancer therapies. For example, a recent study of 945 patients with previously untreated metastatic melanoma showed that nivolumab alone or combined with ipilimumab produced longer progression-free survival than ipilimumab alone. For patients with tumors with positive expression of the PD-1 ligand—associated with better responses to anti–PD-1 immunotherapy—there was no difference in the overall median survival rate for nivolumab or nivolumab and ipilimumab combined, but among patients with PD-1 ligand–negative tumors, progression-free survival was longer with the combination therapy than with nivolumab alone (Larkin J et al. N Engl J Med. 2015;373:23-34). James L. Gulley, MD, PhD, chief of the genitourinary malignancies branch and head of the immunotherapy section at the National Cancer Institute in Bethesda, Maryland, noted that combining immunotherapy with other treatment modalities such as radiation therapy and chemotherapy can boost the effectiveness of immunotherapies by enhancing the ability of the immune system to recognize or kill the tumor. Despite having helped many patients with melanoma and other cancers, immunotherapy drugs, like other cancer treatments, may cause adverse drug reactions in some patients, noted Michael Postow, MD, a medical oncologist at Memorial Sloan Kettering Cancer Center in New York City. In a study comparing the efficacy of nivolumab, ipilimumab, and both drugs combined for treating melanoma, patients’ adverse drug reactions included rash, diarrhea, colitis, hepatic changes, hypothyroidism, hyperthyroidism, and pneumonitis (Larkin J et al. N Engl J Med. 2015;373:23-34). Patients were enrolled in the study between July 2013 and March 2014, and the data collection occurred in February 2015. During the study, 36.4% patients in the combination group, 14.8% in the ipilimumab group, and 7.7% in the nivolumab group dropped out because of adverse drug reactions. One patient in the nivolumab study died from adverse effects of the drug, as well as 1 patient in the ipilimumab group. Adverse events associated with immunotherapy can occur not only during the treatment phase, but also after treatment. Ongoing adverse effects of ipilimumab, such as rashes, diarrhea, anorexia, and fatigue, have been reported in some patients as long as 2 years after a 12-week treatment period (Hodi FS et al. N Engl J Med. 2010;363:711-723). Although adverse drug reactions generally resolve when immunotherapy treatment ends, hypothyroidism can be permanent but treatable with medication, said Postow, noting that more research needs to be done on the long-term effects of immunotherapy. Investigational work also needs to be done on the use of immunotherapy for patients with autoimmune conditions such as multiple sclerosis, particularly. “Some patients with autoimmune diseases have been safely treated with immunotherapy, but others have had worsening of their autoimmunity or other side effects,” explained Postow. Allison experienced a new perspective on his work when he met a young woman whose advanced melanoma was treated successfully during the first clinical trial of ipilimumab. A recent college graduate planning her wedding at the time of her diagnosis, she is now married and the mother of 2. A year after she was declared tumor free, they met at Memorial Sloan Kettering Cancer Center. The woman greeted him with a hug.